CHAUVET®, a leading manufacturer of professional lighting, won the Best Big Booth award at LDI 2011 in Orlando. Crowds of guests gathered at the CHAUVET® booth, amazed by the “Lighting Is INfectious” theme. This isn’t the first time CHAUVET®‘s creativity was recognized; in 2007 CHAUVET® won Best Big Booth for its “It’s Green Thinking” theme. “I am very grateful for all the hard work and creativity that went into this INfectious presentation. Congratulations to all and special kudos to the marketing team, the product team and the tradeshow setup crew,” said Albert Chauvet, CEO of CHAUVET® and ILUMINARC®. Almost 300 CHAUVET® MVP™ video panels were interlocked into a large-scale wall framing out the booth on three sides to create an immersive experience. Against that backdrop, a truss spider held over 200 fixtures, including the premiering COLORado™ Zoom Tour wash lights and Legend™ 412 LED moving yokes. At the floor level, a runway was flanked by Q-Wash™ 560Z-LED moving heads and the new revolutionary Épix™ Series of pixel mapping fixtures running on ArKaos Kling-Net protocol. It took four days for the CHAUVET® team to set up the “INfectious” booth, using seven universes of control and rigging about 17,000 pounds of gear—including cables. “We used 46 pieces of truss, 31 motors, a custom-built motor control and ran about 2,000 feet of cable,” said Mike Graham, product manager for CHAUVET® Professional. The creative team of CHAUVET® enlisted the help of lighting designer Chris Lisle [link: http://chrislisle.com/gallery/], most recently involved in the Miranda Lambert tour, and of Scott Chmielewski, president of Digital Media Designs http://digitalmediadesigns.net/] and a programmer for the band Phish [link: http://phish.com/]. Chmielewski helmed the controls and video integration, while Lisle spent more than 12 hours programming a show that featured 57 cues controlling 17 different CHAUVET® fixtures. 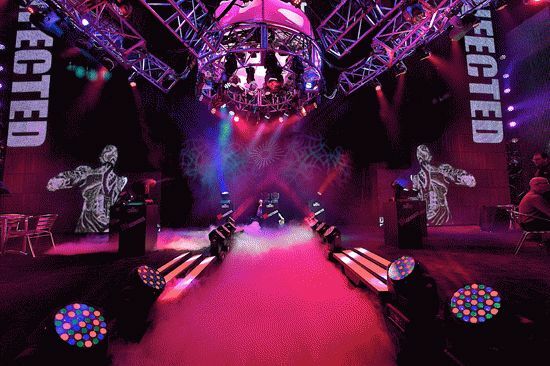 The making of the CHAUVET® booth was foremost a labor of love. “Admittedly, we have a love affair with light—light fixtures, light design and lighting in general. Lighting is infectious!” said Berenice Chauvet, vice president of CHAUVET®.